“From the preface of the Handbook for 1946, it appears that prior to 1946, the monthly notes contained a “sky page”. This first edition of the Handbook states that it had previously been suggested that this information should be made available in the form of an annual handbook. This was published as a roneod foolscap sized 12 page document. Additional copies were available to members from the Secretary at 1/- each or for non-members at 1/6 from Juta and Co, Darling Street, Cape town. Acknowledgements for data were made to R P de Kock, Dr van den Bos and Mr Cousins. “Suggestions of how this handbook can be improved, if its reception is sufficiently flattering to justify its publication in future years will be very welcome.” Fifty years later, its existence has certainly been justified. There is no mention of who was responsible for editing the book. The 1947 edition contained a list of members of the Society including 15 schools and other institutions. In 1948 it is recorded “the chief credit for the preparation of this booklet is due to Dr H Stoy of the Royal Observatory, but sincere thanks are also tendered to Mr R P de Kock for the numerical data of the rising and setting of the planets. The 1949 Handbook was printed and the size reduced to 165 x 114mm. It comprised 16 pages with a light blue cover. Here credit is again given to Dr R H Stoy and thanks rendered to Mr R P de Kock and Dr Cousins and “The Society is deeply indebted to Mrs du Toit and to Mr Barwick whose joint efforts have made it possible to publish the Handbook in its present form. Mr P Achten is reponsible for its newer design.” There three names do not appear in the list of members as of 31/12/1947. A new format was brought in 1957 by which time the Transvaal Centre’s branch of the computing section prepared most of the material with Mr R P de Kock providing data on bright and variable stars and it was edited at the Cape. It was again roneod on quarter size paper. The 1960 edition was “computed and prepared by the computing section of the Transvaal centre and the editorial board of MNASSA.” It was now priced at 2/- for non-members. The 1961 edition again included a list of members. In 1962 it cost 25 cents and the acknowledgements indicate Cape Town had now become the source of data. Mentioned are Drs Evans, Lourens and Fuhr, Messrs Churms, Smits, de Kock, Venter and van Zyl and to Miss Y Z R Thomas who typed the manuscript. In 1969 it changed to its present size. The name of Miss Y Z R Thomas appears, acknowledging her preparation of the manuscript, until the 1972 edition and from the 1973 edition the UCT Astronomy Department took over with Pat Wild as editor. From 1974-1975 it was prepared by Tony Fairall as editor. During 2003, a committee consisting of Auke Slotegraaf, Maciej Soltynski and Cliff Turk, assisted by many helpers, redesigned the Handbook. 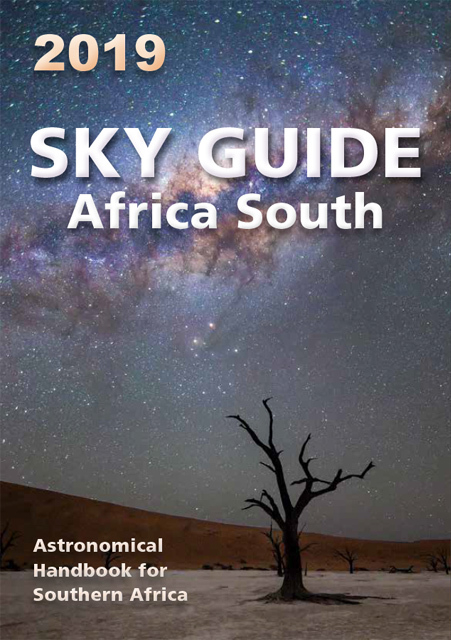 After much deliberation the name was changed to Sky Guide. 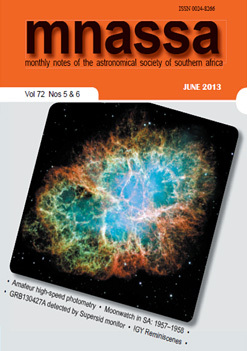 Booth, P (1996) Astronomical Handbook for Southern Africa. ASSA: Cape Town, p 56.